This beautiful little radio is the export version of the Sanyo 6C-9 marketed under the Channel Master brand name, and also quite similar to the Sanyo 6C-8 that was released just a few months earlier. It's a beautiful radio, from the gold anodized speaker grille all the way to that fabulous reverse paint treatment that highlights the tuning dial. The deep crimson cabinet is also attractive, (more so in person than in this photo). 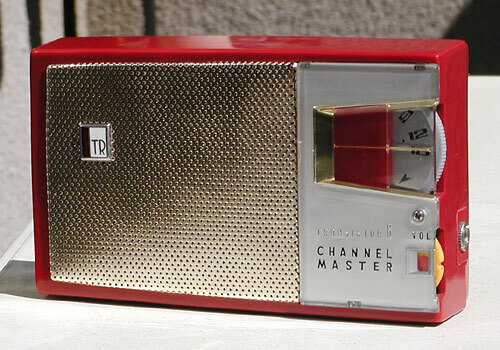 As all collectors know, Channel Master sold a wide variety of radios in the late fifties and early sixties made by Sanyo . The model above is not only one of the earliest, but also a fantastic example of why Channel Master transistor radios deserve more respect than they are often paid.